Apples have been a symbol of love, fertility, and abundance since ancient Greek times, when the goddess of the Earth, Gaia gave her granddaughter Hera a golden apple tree as a gift at her wedding to Zeus. 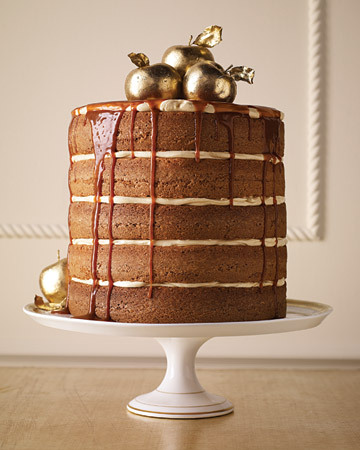 Wouldn't a spiced apple cake filled with caramel buttercream and drizzled with caramel, then topped with golden lady apples be dreamy for a fall wedding? Another dreamy thing I'm excited about is A Crimson Kiss' very first reader's survey; I'd absolutely love your feedback to build a better, more beautiful Crimson Kiss, and by participating you can win a J.Crew e-gift card–perfect for your holiday shopping! A winner will be announced next Friday morning, November 30th; to take the survey and be entered to win, head here! Happy Black Friday, everyone! Confection by Betsy Thorleifson of Nine Cakes for Martha Stewart Weddings. Ooooh, very cool & unique cake! Such a beautiful cake, and of course I took your survey! I follow you on everything :) Hope you had a wonderful Thanksgiving! Hope you're having a beautiful weekend! Oh my, this looks heavenly!! And what a marvellously fresh idea for a wedding cake, love it!! Now off to take the survey, although I can't imagine 'A Crimson Kiss' could get any better! Its only 8:00am but I could totally go for this cake right now. and now on twitter too. Cant believe I didnt already follow you on there! This cake is gorgeous! I wonder how difficult it would be to try and tackle something like this for a special occasion. Love it when simple is this stunning! that picture is to die for!